Jessica knows a few things about the three R's and is showing Baby Herman how to spell. This hinged pin was part of a series featuring different Disney characters. This pin is a chalkboard shape and writing on the front says "Roger, Jessica" and has a stack of books. 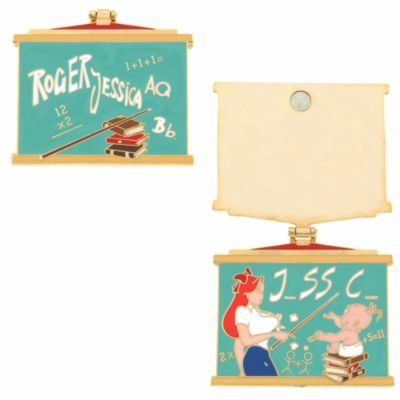 This part of the pin can open up on its hinge and revel another layer below which shows Jessica dresses as a teacher and trying to teach Baby Herman. Baby Herman is sitting on the stack of books and is holding his smoking cigar.